Citation Information: J Clin Invest. 2018;128(11):4938-4955. https://doi.org/10.1172/JCI98058. 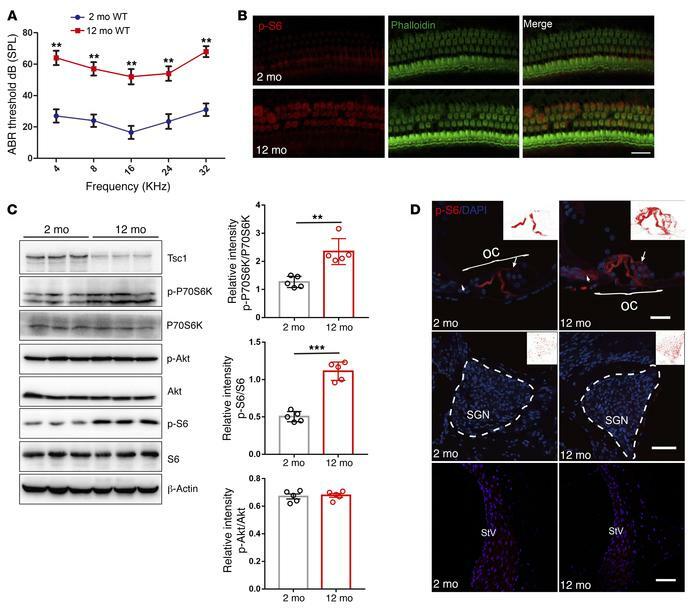 mTORC1 signaling is activated in the NSE of aging cochlea in C57BL/6J mice. (A) ABR hearing thresholds were increased in 12-month-old WT mice compared with 2-month-old WT mice. n = 10. (B) Representative images of immunolabeled p-S6 (red) in OHCs with phalloidin staining (green) in 12-month-old WT mice and 2-month-old WT mice. n = 3. Scale bar: 10 μm. (C) Western blot analysis of sensory epithelium shows increased p-P70S6K and p-S6 (235/236) levels and decreased Tsc1 levels, without any alterations in p-Akt (S473) levels, in 12-month-old WT mice compared with 2-month-old WT mice; p-P70S6K, p-S6 (235/236), and p-Akt (S473) levels are quantified on the right side. Protein lysates were obtained from sensory epithelial tissues from cochleae. β-Actin served as the sample loading control; n = 5. See complete unedited blots in the supplemental material. (D) p-S6 immunolabeling (red) was stronger in middle hair cells (arrows) and Deiters cells in the organ of Corti (OC) in 12-month-old WT mice than in 2-month-old WT mice; however, no significant changes were detected in the pillar cells, the SGN, and the stria vascularis (StV). n = 3. Scale bars: 20 μm. Data represent the mean ± SEM. **P < 0.01, ***P < 0.001, by 2-tailed Student’s t test.